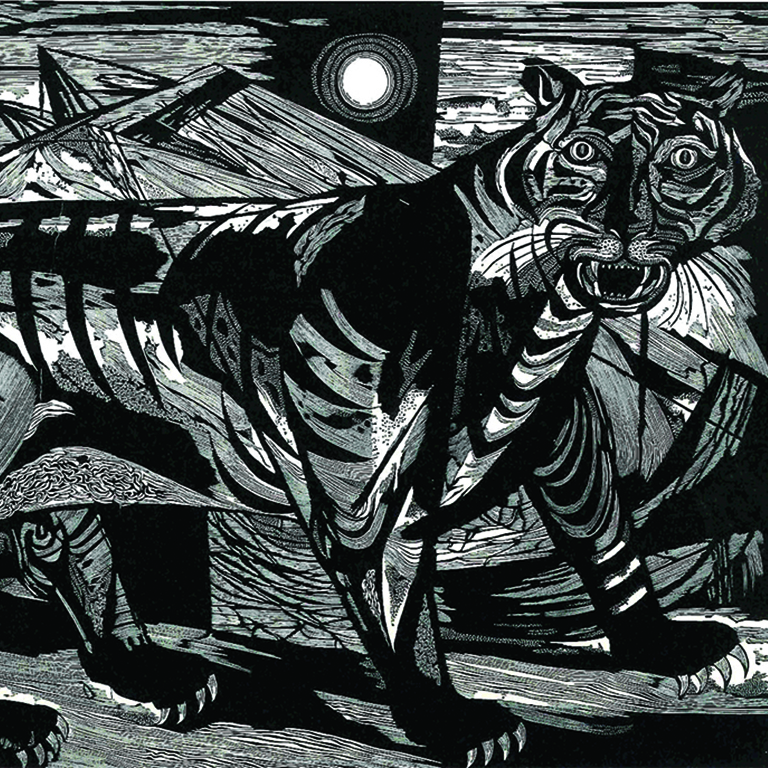 "Tiger" by Misch Kohn, wood engraving, 1949. Courtesy Kokomo-Howard County Public Library. KOKOMO, Ind. — From humble beginnings in Kokomo, Misch Kohn built a career as a pioneer in printmaking, with his work exhibited in galleries and museums worldwide. Starting November 11, he will inspire a new generation of artists, as the Indiana University Kokomo Art Gallery hosts Misch Kohn: Beyond the Tradition, a retrospective that incorporates work spanning his 60-year career, including student works never before exhibited publicly. The exhibition, which commemorates the 100th anniversary of the artist’s birth, opens with an illustrated lecture by Jo Farb Hernández, curator and foremost expert on Misch Kohn, at 6 p.m. Friday, November 11, in Kresge Auditorium. The lecture is funded by the Addison Locke Roache Memorial Lecture Fund at IU. A reception hosted by the IU Alumni Association Howard-Tipton Chapter will follow, from 7 to 9 p.m. in the Art Gallery, in IU Kokomo’s Library Building, 2300 S. Washington Street. Halperin noted that Art Gallery Director Tara Scott led successful completion of an extensive approval process recommended by the American Association of Museums to exhibit Kohn’s work, and that it is an honor to host the exhibition. As the campus reclaims its native son, it also wants to encourage aspiring artists, by hosting tours for area students, from middle school through college. Also, these visitors will receive a limited edition book commemorating the exhibition, while supplies last. The book was made possible by a grant from the Tippecanoe Arts Federation, the Indiana Arts Commission, and the National Endowment for the Arts. Kohn’s influence will continue to be celebrated after the exhibition, as IU Kokomo received a project grant from the IU Office of the Bicentennial, to purchase a piece of Kohn’s work for the campus collection. The exhibit also will include four hands-on printmaking workshops, led by Minda Douglas, associate professor of fine arts, with dates and times to be announced on the Art Gallery website, iuk.edu/artgallery. During his career, Kohn (1916-2003) studied with Diego Rivera and Clemente Orozco in Mexico, and Pablo Picasso and Marc Chagall in France. He was a pioneer in large-scale printing. The exhibition continues through Saturday, December 10, and is free and open to the public. Free parking is available on campus. The IU Kokomo Art Gallery is open 10 a.m. to 2 p.m. Mondays, 10 a.m. to 4 p.m. Tuesdays and Thursdays, 9 a.m. to 6 p.m. Wednesdays, and noon to 4 p.m. Saturdays. It is closed Sundays and Fridays. The exhibition was produced thanks to generous donations provided by the Cherry Family Foundation, the Richard Florsheim Fund, the Waletzky Charitable Lead Trust, and an anonymous donor. It is also funded by the IU Kokomo Exhibitions and Gallery Fund, created by generous donors to IU.